Although skull rings have been in the market for decades, only recently have they made a comeback due to the growth of CAD jewelry. In fact, Skull Engagement Rings have gained a newfound popularity among women who never would have thought of as “biker chicks”. Due to the popularity and demand for skull rings, the number of jewelers trying to make them has increased. There are many online stores that offer skull rings, but it is important to do your research before committing. Most of them are in Asia and not all skull rings are created equal. This is our Goth inspired skull engagement ring. On each shoulder and facing outward are two skull. Weaving around the skulls are ribbons accented with stones. Discover our collection of handcrafted Skull Engagement Rings. We also have skull wedding rings. Don’t see what you want? Contact us and we will create it for you! This is our Smokin’ Skull Engagement Ring. The center stone is bezel set with a halo of diamonds around it. Beneath that, the skulls rest among billowing wisps of smoke. We also have a shorter version of the ring with a smaller skull as well. 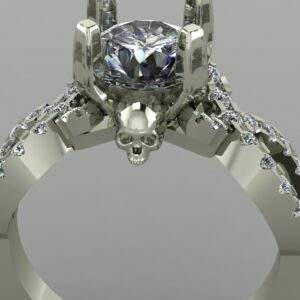 With the recent explosion of 3D CAD programs and custom jewelry, Skull Engagement Rings for both Men and Women have recently soared to a wild popularity in the jewelry industry. Even men who only wear their wedding bands have been known to shop for skull rings. Although skull jewelry in the recent past has mainly been worn by rockers and bikers, it is now very visible in mainstream pop culture. Case in point, many celebrities have been wearing skull jewelry in the public eye for awhile now. Whether you like how skulls look or are infatuated with what they can mean, Valeria Custom Jewelry has created a variety of Skull Engagement Rings and Wedding Bands for both women and men. This Black Diamond Skull Engagement Ring is a great one for lovers of skull rings. Each shoulder has a skull accented with diamond in its eyes. The skulls are held in place by some bone knobs! If you would like to use another skull in this ring, send it over. The meaning of skulls and what they symbolize can be what is most appealing to Skull Engagement Rings seekers. Most often, a skull symbolizes mortality and the end of life. This can be the end of an enemy, end of a concept, or end of a loved one. Additionally, skulls represent the rebirth of a new life, but to the majority of people, skulls are solely an indication of the shortness of life. The popularity of Skull Engagement Rings makes them readily for sale by many jewelry designers. Custom skull rings are usually heavy-duty with distinct designs. This is another skull infinity engagement ring. It is a little more elegant than the one below. We would have made the stones go further around the ring. But..it wasn’t our ring. Our custom Skull Engagement Rings can be cast in all kinds of metal. The standbys Silver and Gold are the most common metals for Skull Engagement Rings. However, you will find skull rings made with more exotic metals such as Platinum and Palladium. With custom jewelry, there are hundreds of ring designs for you to select from; some designs will have gems in the eye sockets. Some will have gems on the edges of the band. The most popular stones used in designer skull jewelry are diamonds. 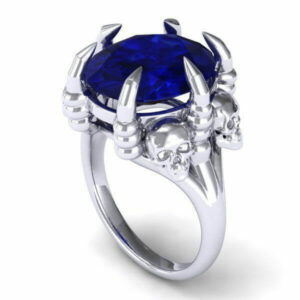 This Clawed Skull Engagement Ring is one of the more interesting skull engagement rings we have created. The 10x8mm Sapphire is held in place by 6 clawed prongs, so it isn’t going anywhere. On each side of the center stone are 2 skulls. There are tons of skull types to choose from when it comes to Skull Engagement Rings. Some skulls show emotion while others are non-descript. Skulls can also be used with other items such as fighters, mystical symbols, and animals. Additionally, most rings use more than one skull in their design. Whether you want a single skull ring without stones or a multiple skull ring iced out with diamonds, Valeria Custom Jewelry can create what you are looking for while providing an excellent value. Although the rise in demand of skull rings men has increased their availability, don’t be fooled by a cheap Asian Skull Engagement Rings. Get a quality one from Valeria Custom Jewelry! This ring was actually a guard that we made 2 of and soldered to a the customer’s existing Engagement Ring. It had a skull facing outward with diamond accents on the band. Give us a shot for Skull Engagement Rings! Our Skull Engagement Rings show a creativity and working knowledge of jewelry design most in the world of custom jewelry do not possess. Because every ring is made to order, no two are totally alike. Be secure in the fact that that your rings are made with your uniqueness in mind. And with our diamond and gem contacts that span the globe, Valeria Custom Jewelry is able to ensure that the stones and metals used to create your Skull Engagement Rings are of the highest quality and ethically sourced. Why purchase mega-mass produced Skull Engagement Rings from chain stores that anyone can own when we can create a skull ring showing your personality? This is one of our first Skull Engagement Rings. It had a french pave set infinity band with black diamonds in it. Underneath the center stone was 2 skulls. If you like the head, but not the band, we can always create a ring with a different band. We know that you can find Skull Engagement Rings on Ebay or Etsy that have been mass produced in Asia. Although they might cost less, there are reasons for that. These ring are manufactured in Asian sweatshops where labor is pennies on the dollar versus something made in the USA. They also make their Skull Engagement Rings very thin and lightweight. This makes it very easy for stones to fall out. It also makes the ring less durable. Click HERE to learn more about custom jewelry, browse our portfolio, or to contact us about a Skull Engagement Ring. Click HERE to see our portfolio of custom engagement rings.